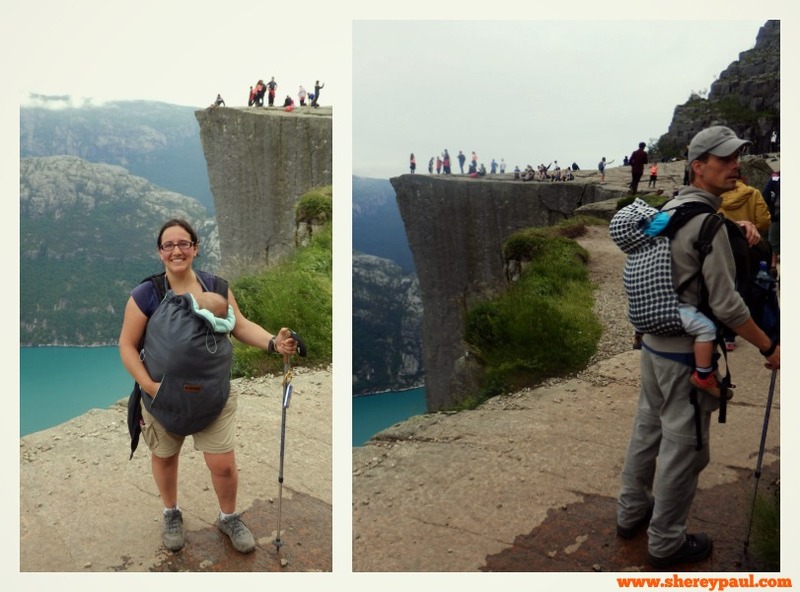 The highlight of our three weeks trip through Norway was, without a doubt, the hike to Preikestolen with baby and toddler. 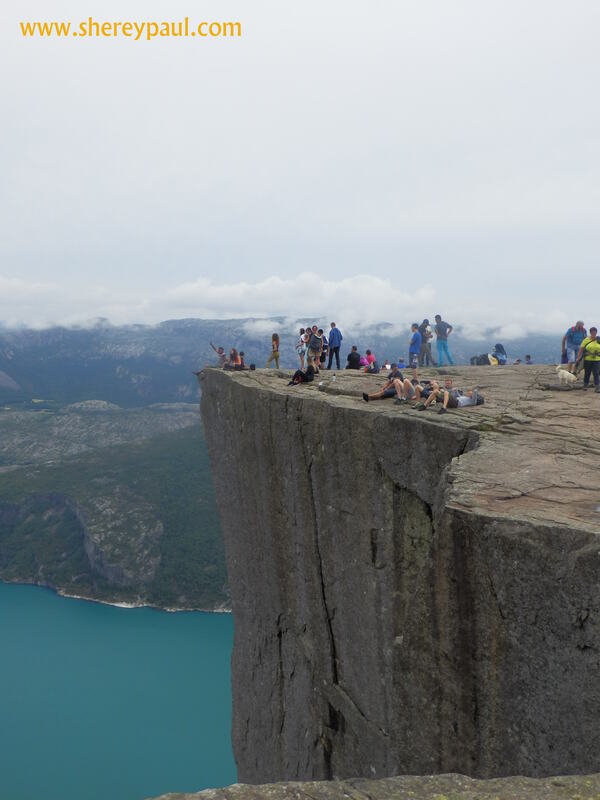 Preikestolen, also known as Pulpit Rock, is the most famous tourist attraction in Ryfylke, a cliff of 604 meters over the Lysefjord. The plateau is approximately 25 x 25 meters, flat and you can enjoy a spectacular view of the Lysefjord and surrounding mountains. The hike from the parking to the top is almost 4km one way, so not that long but some good condition is desired as there’re some challenging parts on the way. 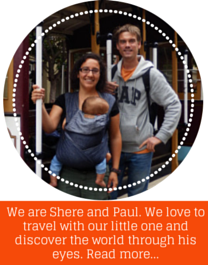 Before we went there, I looked for experiences about hiking with a toddler. Our little one is used to walk and to be carried while hiking, but my sister (who hiked it at the end of September on a rainy day) was not sure if it was suitable for kids. 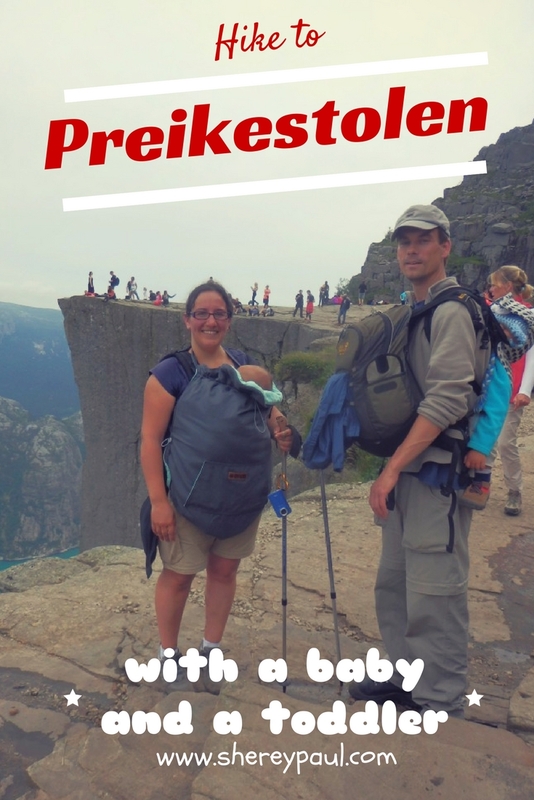 So here our experience and some recommendations to hike to Preikestolen with baby and toddler. If you missed before, we had already a short video about our hike to the Pulpit rock with kids. The length of the trail is almost 4km and it combines a well-paved path, stairs made of rocks with different heights, rocky paths and narrow crossings. For me, there were two challenging parts: the ascent of the uneven “rock stairs” (even though the trail has recently been upgraded by Nepalese Sherpa stonemasons) as well as the jump/descent from a big stone. Both tricky if carrying a baby and also slippery with rain. It took us 2 hours to reach the top and another 2 hours to descend. 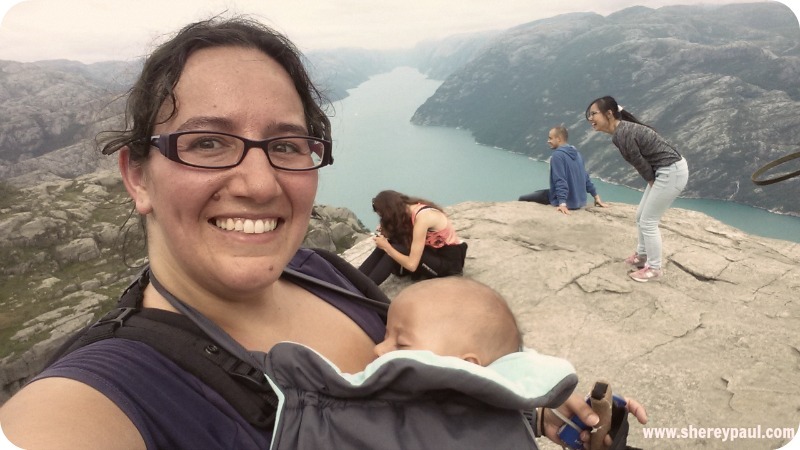 Our hike to Preikestolen with baby and toddler started with our toddler walking around 15 minutes and then being carried to the top. On the descend, we carried him for another 15minutes and then we walked the trail down. Sometimes with the help of Paul as the height differences were too high for him. This time the battery of my watch was still full, so I was able to track the hike. The hiking season is April to October, but the best months are June and July as the day are really long and you don’t have to hurry up. 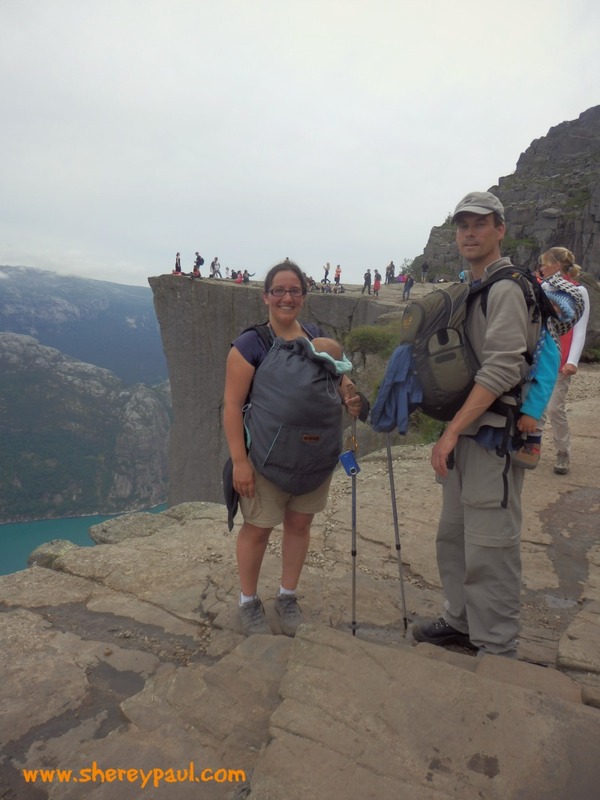 We did the hike to Preikestolen with baby and toddler at the end of June. 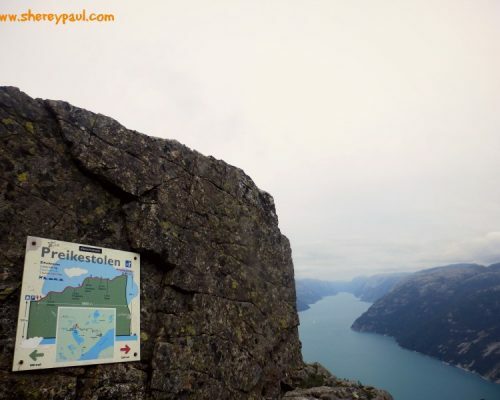 And as we first drove from our previous destination to the Preikestolen camping and had lunch in our campervan, we started the trail at 14:45. At that time, there weren’t many people starting and just some coming back. I guess the busiest time is around 10 to 12, as the tourist from the cruises don’t come really early and they also have to leave relatively early. If hiking it again, I would either start early, have a long picnic and come back in the afternoon, or directly start in the afternoon. Our initial plan was to hike the morning after, but the weather forecast for the following days was a lot of rain. Hiking in the rain with a baby and a toddler is not fun and hiking to the Pulpit Rock when raining is even dangerous. My sister hiked with little rain to the top (she joined a cruise, so you only have the possibility of doing it one day) and she said it was really slippery. We saw someone falling and injuring herself (I must say she was mid 40 and didn’t wear proper hiking/sport shoes). I love it!! The hike to the Pulpit Rock is on my Top 5 travel experiences. I don’t know if it also happens to you, but It’s becoming more and more difficult for me to get really impressed. Well, the moment we reached the top and we looked around, we became speechless. The way up was a challenge, even a bigger challenge when you’re carrying your 3 months old baby. But he did it great, I changed his diapers and nursed him before leaving and after a short while, he fell asleep. Liam also fell asleep on the way up and it was the reason we didn’t stay very long at the top: a toddler running around next to a cliff is not really a good idea. The last part of the trail has some narrow places where on one side there’s a fall of a couple of hundreds of meters. So we quickly descent that part and magically both children woke up 🙂 For Mika was time to nurse again and for the rest to have a bigger snack and rest. 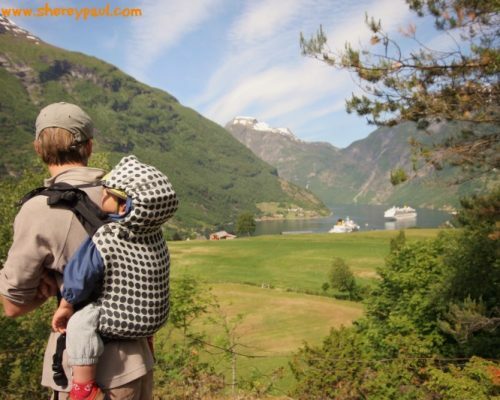 I guess I wouldn’t be able to plan it better, after nursing he also pooped, so I changed his diaper (always bring a zip bag, so you can put the diaper inside and avoid a stinky backpack). We did the rest of the way down at Liam’s path. He loved to descend rock stairs, jumping around and watch all the little animals. He definitely needs his own walking stick 🙂 Watch our video to see why. I started the hike with a jacket and long trousers on, halfway I had it warm! This is for me always a challenge. How I and the baby should wear so we are both neither too cold or to warm.not cold? When hiking, I get it warm easily, but the baby won’t. This is the reason I don’t like to wear a baby-wearing jacket. I prefer a baby-wearing cover, like the one I have in the pictures from bykay. The cover kept Mika warm the whole hike and I was able to take out some layers. As it’s adjustable, one size fits all! The perfect complement 🙂 Try to find us in the picture! 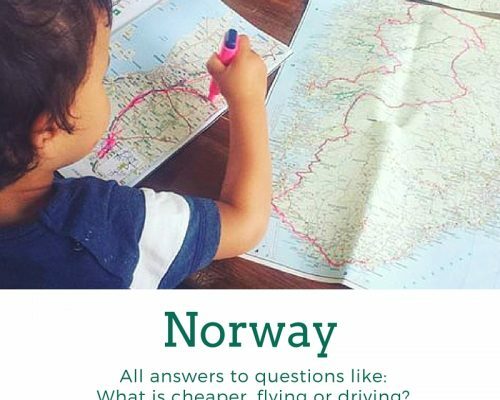 What is cheaper flying or driving to Norway? Well done you. 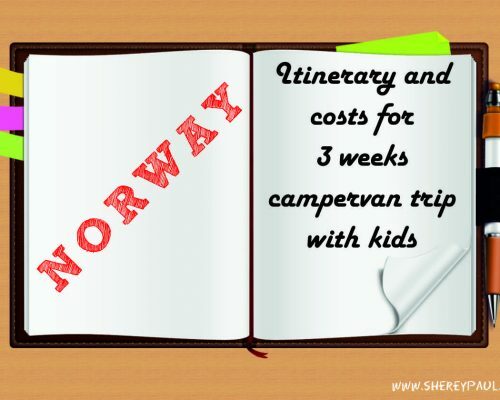 It would be hard doing the hike on your own let alone with little ones. That hike sounds a bit tricky, but that view looks like it’s worth the effort! 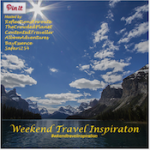 Great tip about timing the hike around the cruise ships. I wouldn’t have thought about that, but it totally makes sense! 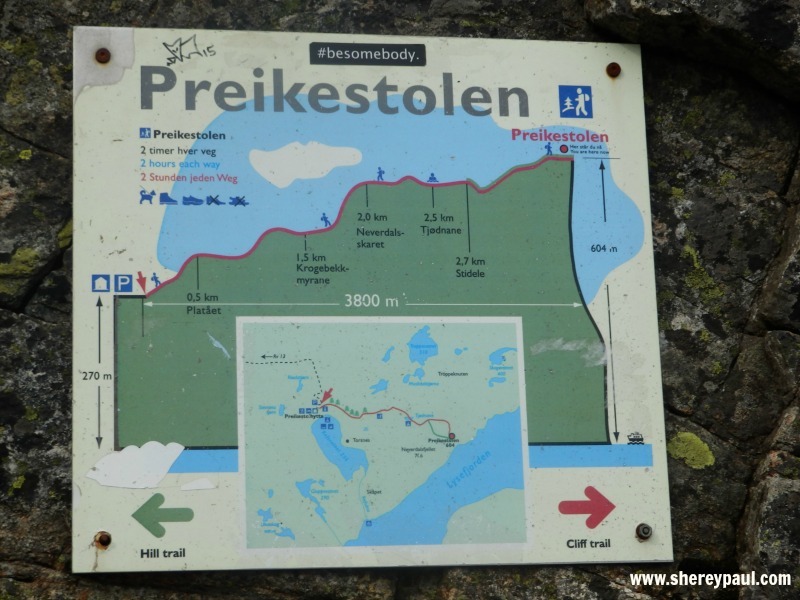 Preikestolen seems like a great place for hiking, Shere! 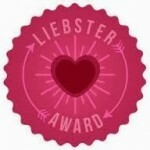 Amazing post!